The longest new comic book day of the year. 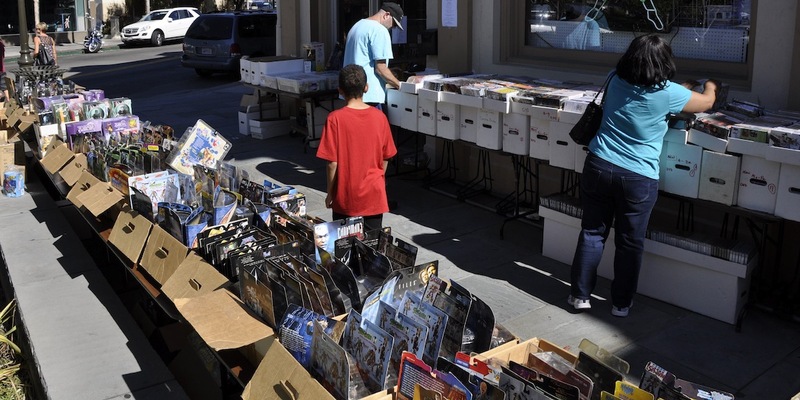 You can read comics outside for 2 minutes longer than last Wednesday. 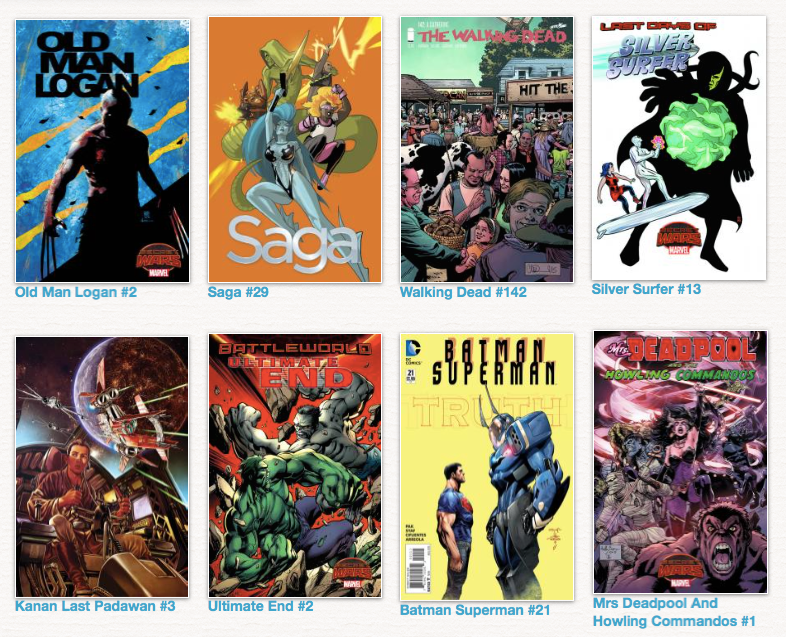 Here’s a tiny sample of what we’re expecting Wednesday, July 1, 2015. Kudos to GoCollect.com for putting together a list each week so we can borrow it. Click here to see their complete list. I’m leaving and will be gone for 3 Wednesdays starting today! Barb Wire is back! Hydra gets’s its – or is it their – own book. Red Skull gets his own book. Lando gets his own book! The Spirit gets his own book! Again! Here’s a tiny cover gallery of what should be there. I’ve noticed our source is not always perfect and sometimes predicts an occasional arrival a little early. Also, I don’t have all variants memorized and it occurs to me that GoCollect.com chooses one of who knows how many to show and the one they show we may or may not get, or it may be $10 or more. So another disclaimer is needed: comics shown on this page MAY be subject to price and availability anomalies without notice. Here’s a tiny sampling of what we’re expecting Wednesday, June 24, 2015. Much gratitude to GoCollect.com for putting a list together each week so we can borrow it. Click here to see their complete list. Marvels’ “Last Days of…” hits 3 more titles this week Black Widow, Loki, and Punisher. 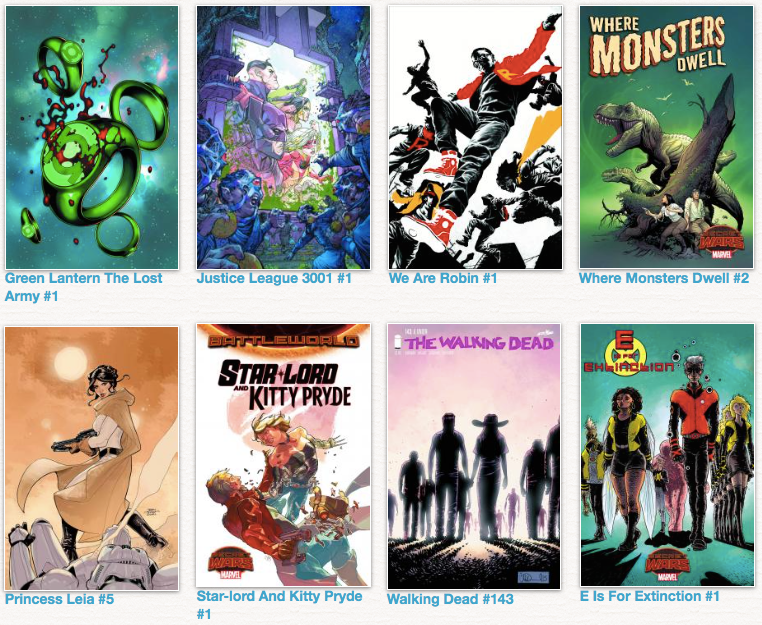 DC # 1’s include Green Lantern Lost Army, Justice League 3001, and We Are Robin. Star Wars Princess Leia #5, Walking Dead, Fight Club and Disney’s Inside Out one-shot round out the list of mentionables. Here’s a tiny cover gallery. Biggest week in quite a while, in number of titles on the wall. Here’s a tiny sample of what we’re expecting Wednesday, June 17, 2015. Much gratitude to GoCollect.com for putting a list together each week so we can borrow it. Click here to see their complete list. 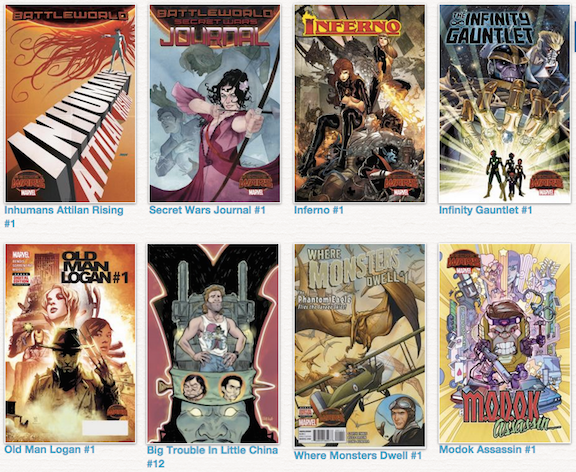 Secret Wars is barely to be found this week (just Deadpool’s SW), and yet, we have about 15 more titles than last week! This year should be called Year 1 because both DC and Marvel are starting over or re-vamping old characters, or whatever and the avalanche of Number One issues continues: Black Canary, Doomed, Dr. 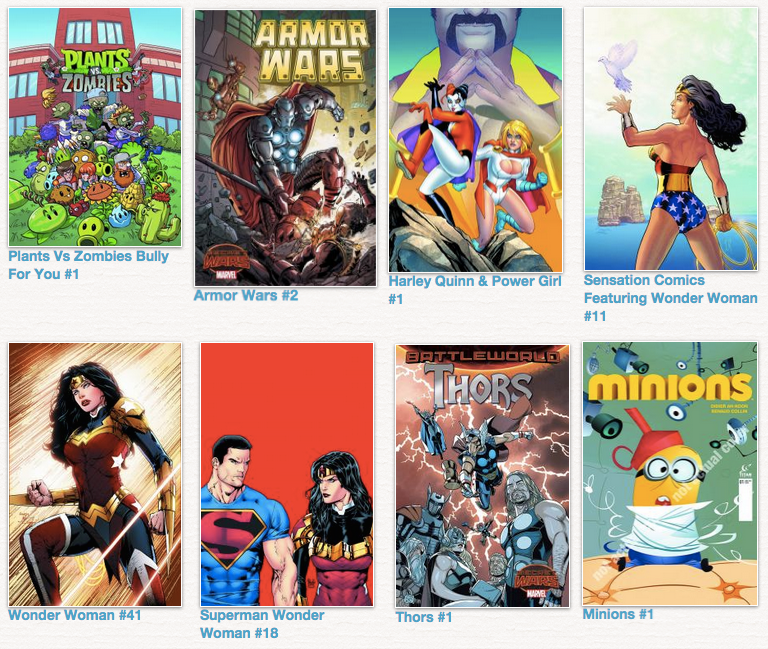 Fate, Harley Quinn & Power Girl, JLA (9 covers), Martian Manhunter, Prez, Robin Son of Batman (who knew? ), Secret Six are all number #1’s this week, and Marvel has Thors (plural), Squadron Sinister, and Runaways (Battleworld) just starting (over). Plus, to get ready for more 1’s, Magneto and Ms. Marvel both announce “Last Days of…” above the title this week. From the movies and other media, we have a new Mad Max Fury Road “Furiosa”, Minions and Plants vs. Zombies -all number one’s! This could also be called the year of change. I heard Marge and Homer will be divorced next season. What’s the world coming to? I’ve noticed our source is not always perfect and sometimes predicts an occasional arrival a little early, as in Thors #1 being on last week’s list in stead of this week’s. Also, I don’t have all variants memorized and it occurs to me that GoCollect.com chooses one of who knows how many to show and the one they show we may or may not get, or it may be $10 or more. Here’s a very small sample of what we’re expecting Wednesday, June 10, 2015. Kudos to GoCollect.com for putting a list together each week so we can borrow it. Click here to see their complete list. GoCollect had Neil Gaiman’s 1602 coming out last week, but it didn’t and I don’t see it here this week so who knows? 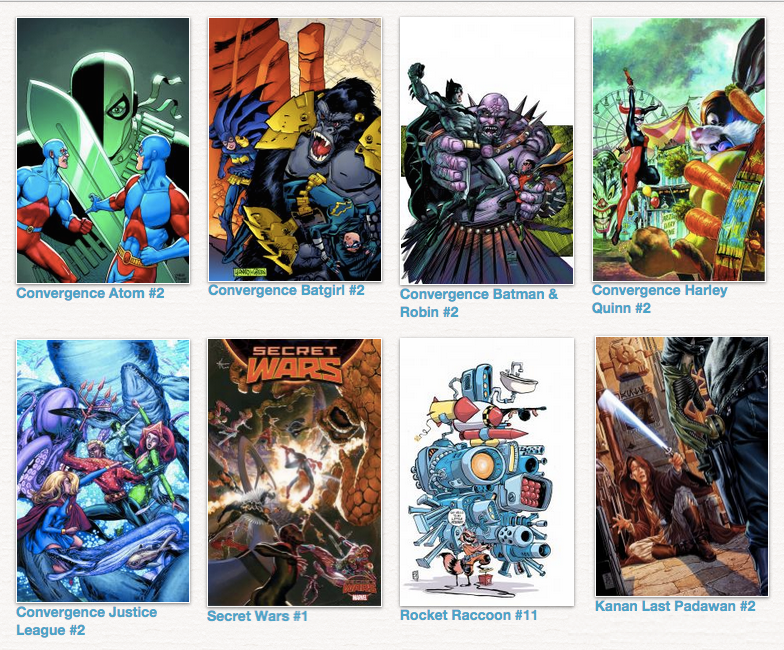 Mrs. Deadpool, Starfire, Earth 2 Society, and Thors (plural with an “s”) lead off the continuing summer blizzard of number 1 issues this week – the first 16 on the list are #1! Also the newest Saga, Walking Dead and Star Wars Kanan are sure to please awaiting fans. What’s coming out June 3rd, you ask? Here’s a short list of what should be in the store Wednesday, June 3, 2015. Many thanks to GoCollect.com for putting this list together all of us fans. Click here to see their complete list. Okay THIS week brings us Secret Wars #3, Groot #1 (it had better have some supporting characters or it will be an EXTREMELY fast read! 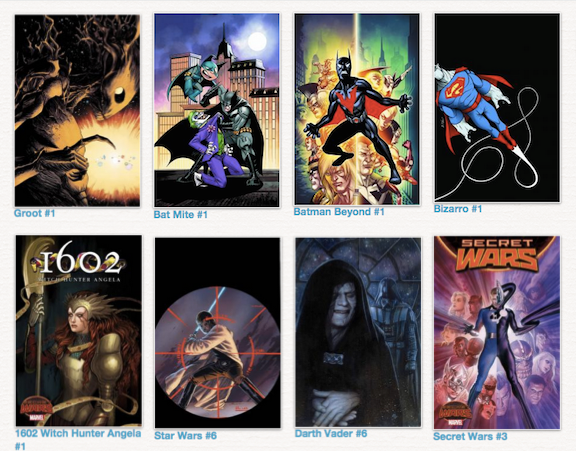 ), a re-boot of Neil Gaiman’s 1602 starring Angela this time, Star Wars #6 and Darth Vader #6, Bizarro #1, Batman Beyond #1, and Bat-Mite #1! 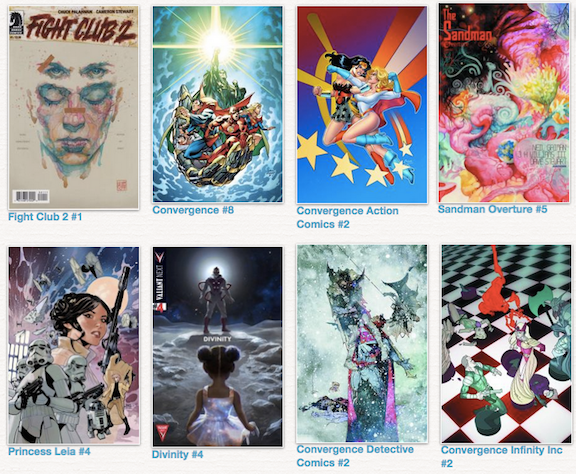 So the Post Convergence is looking pretty good! And, of course, the usual dizzying array of other cool stuff to read and enjoy. *Actually, that’s how many different ones we had Tuesday, June 2, and we sold out of several since last Wednesday, so I have to guess 340 back then! Too many cool covers, so here’s a double size sample of what’s scheduled for release Wednesday, May27, 2015. Kudos to GoCollect.com for putting this list together each week. Click here or on the image to see their complete list. 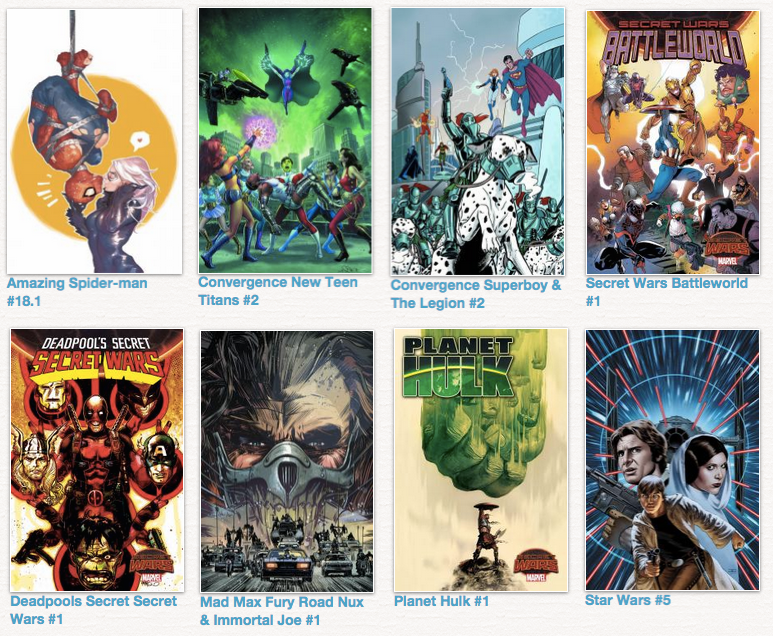 Whhoops, I said last week “Secret Wars Chapter 3 brings…”, which was only the case if you define ” A Chapter” as a week during which the whole crossover bonanza is taking place. Which is a legitimate definition. 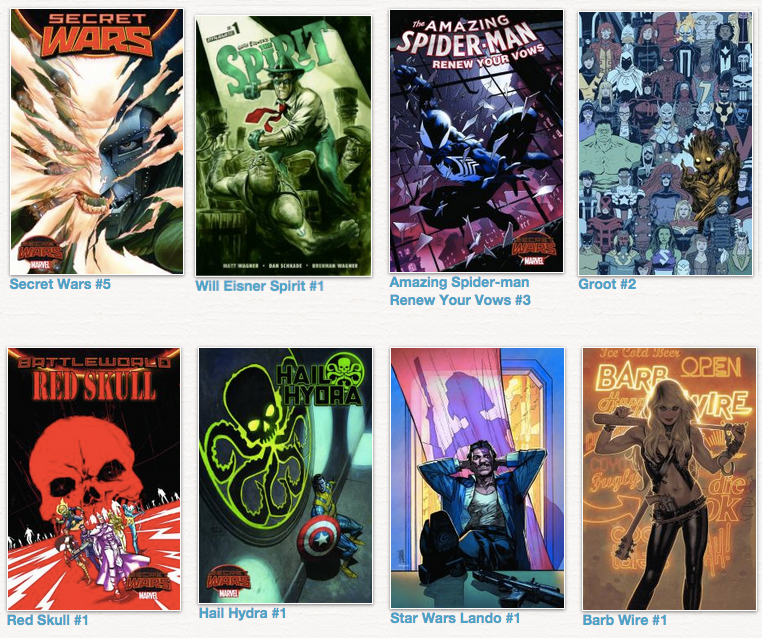 On the other hand, the comic called “Secret Wars #3” is still a week or two away, now, a week later. But “Battleworld” and/or “Secret Wars” as a concept is creeping onto the cover of many of Marvel’s comics again with this week with a bevy of new #1’s. Saturday and Sunday, May 24-25, 2015. 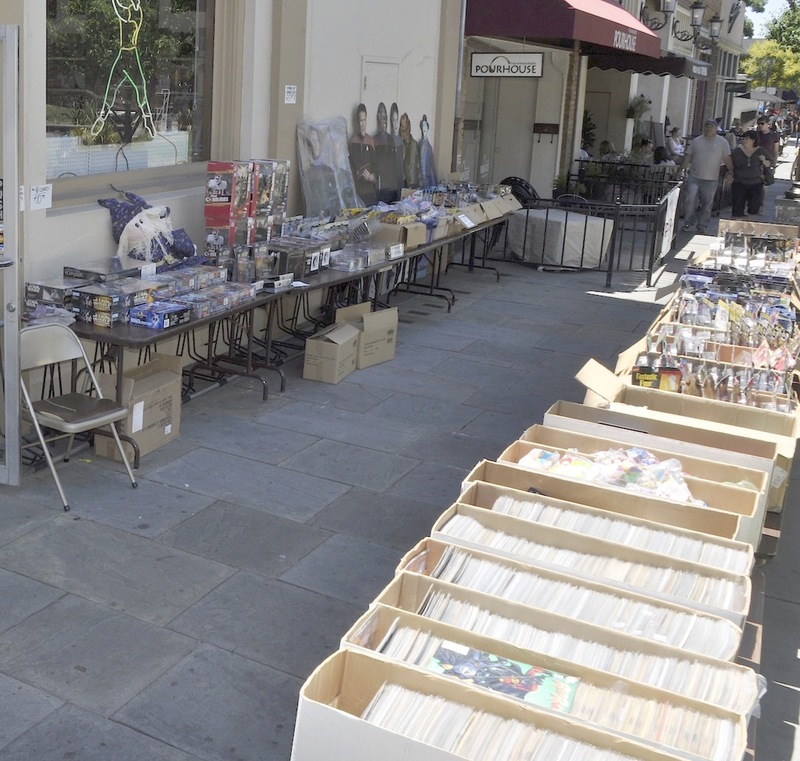 Fantasy Books and Games is celebrating it’s 35th Memorial Day with our traditional Sale, now with Sidewalk attached! The whole store is on sale for discounts from 10% to 25% (except the new MTG Modern Masters that just came in). If you are already on our email list, check your inbox. If you aren’t, click here to sign up and you’ll get all the details in an email. Here’s a sample of what’s scheduled for release Wednesday, May20, 2015. Thanks to the good folks at GoCollect.com for putting this list together each week. Click on the pic to see their whole list. Secret Wars Chapter 3 brings along the first round of tie-ins with Battleworld, Convergence approaches the horizon, Star Wars catches Vader with #5, and Lady Mechanika steams up the Victorians in number 2. And there’s a Mad Max Fury Road comic! Here’s a sample of what’s scheduled for release Wednesday, May13, 2015. Thanks to the good folks at GoCollect.com for putting this list together each week. Click on the pic to see their whole list. Secret Wars rages on into Chapter 2, Convergence continues to diverge, Darth Vader #5, Ponies, Adventure Time, Dr Who 11th Dr, and lot more! And the new Saga! Here’s a sample of what’s scheduled for release Wednesday, April 29, 2015. Thanks to the good folks at GoCollect.com for putting this list together each week. Click on the pic to see their whole list.